Events in central and southern part of Central Asia are important for security of both Russia and India. Currently India is strengthening its historical ties with Central Asian states and looks forward for closer cooperation with Russia in the region, he said. The minister said that cooperation between Russia and India can play an important role in promoting peace, stability and economic development in Afghanistan. It may also be effective in dealing with common challenges such as extremism, terrorism and drug trafficking, he added. Russian President Vladimir Putin and Indian PM Singh also discussed the possibility of direct overland supplies of Russian oil to India and agreed to set up a Joint Study Group in this regard. The two sides signed weapons deals worth almost $3 billion and vowed to increase bilateral trade, currently about $11 billion, to $20 billion by 2015. The Russian leader noted the words of Kazakh counterpart Nursultan Nazarbayev that Turkey asked to join the Customs Union. “I would like to inform you, dear colleagues, that another major economy, one of the largest economies in the world shows the same interest. This is India,” Putin said. Kazakhstan was blamed of blocking the free trade agreement between Russia and India by the Indian officials, Tengrinews reports. According to the Senior Official of the Ministry of Commerce of India, Kazakhstan is trying to assess its relationships with other members of the Customs Union and apparently seeing uncertainty about agreement on Comprehensive Economic Cooperation with India. He hopes that Russia will persuade Kazakhstan to sign an agreement with India, since, as he believes, any economic treaty with Russia must necessarily include Belarus and Kazakhstan. President Putin will certainly do his best to change Nazarbayev's mind, since the Customs Union already lost Ukraine to the European Union and infighting is stalling the development of Putin's Eurasian Union project. New Dehli can count on Moscow's support not only with regard to economic issues. Russian leader Putin and Indian PM Singh reiterated the need to reform the United Nations Security Council and the released statement emphasized Russia's "strong support of India’s bid for a permanent seat in the reformed UN Security Council". Stepping up surveillance along the tense border of China and Pakistan, the Indian Army is equipping its troops with hand-held drones. It has floated a request for proposal for acquiring 49 mini unmanned aerial vehicles (UAVs) last month, which the army feels will be a “game changer,” like they have been for the allied forces in AfPak. Manmohan Singh was not the only Prime Minister who visited China this week. On Tuesday, the country welcomed the Prime Ministers of three neighboring countries: India, Mongolia and Russia. Beijing emphasized that relationships with neighboring countries have to be strengthened to counter the American 'pivot' toward Asia. With Obama not even able to visit Asia, Beijing's strong diplomatic efforts are really making a mockery of the non-existent 'pivot'. The two countries agreed to cooperate on the economy, security, social and cultural matters and on trade, acknowledging the need to mind each other's core interests and major concerns. The focus will be on infrastructure investments and overall plans for connectivity including rail, road, natural gas and power transmission projects. China wants to import more coal from Mongolia by rail to lower the transportation costs and Li added that a free trade area in the border region will also be discussed. The world’s fastest-growing energy market China and world’s biggest oil producer Russia have strengthened their business ties on Tuesday after signing 21 trade agreements, including a new 100 million ton oil supply deal with China’s Sinopec. Under the new energy deal, Rosneft, the world’s largest-listed oil producer, will supply China with up to 100 million tons of crude oil over 10 years. 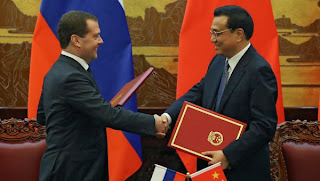 The agreement is testimony the neighbors have "reached a higher and a brand new level of cooperation,” Prime Minister Dmitry Medvedev said during an online chat with Chinese citizens, Xinhua reported. "The world is undergoing an unprecedented upheaval which has seen a sliding US and the West compared with a surging China and other developing countries. Some have assumed that a historical reversal of traditional strength will happen in just 10 or 15 years. Given such changing environment, China-Pakistan relationship in the next 10 years should bolster South-South cooperation and strive for a new globalization system taking such cooperation as the mainstay." In recent weeks, key civil and military officials from Pakistan have been seen reaching out to Central Asian Republics (CARs) – exchanges that hold a great deal of significance for regional security and stability, particularly in the wake of anticipated draw-down of NATO troops from Afghanistan, after a devastating war of over 12 years. New Dehli's increasing interest in Central Asia has not gone unnoticed in Islamabad and so these efforts are also a way to adjust policies to Indian activities. The government of Pakistan has accepted a Chinese demand to proscribe three extremist organisations which are said to be active in the north-western region of Xinjiang. According to BBCUrdu.com, the three organisations — East Turkistan Islamic Movement, Islamic Movement of Uzbekistan and Islamic Jihad Union — have been put on the list of proscribed militant organisations after reports that their members were planning terrorist activities in the region and inciting people against the Chinese government. "The IMU, the rising star of militant Islamist groups, is another tool for the United States and its allies to further their geopolitical objectives and will join the East Turkestan Islamic Movement in destabilizing China's Xinjiang." Nearly a dozen Uyghurs shot dead by police in recent weeks in China’s northwestern Xinjiang Uyghur Autonomous Region have been suspected of plotting a massive bombing campaign as part of a separatist movement, according to a source with knowledge of the case. Police are still on the trail of five others involved in the campaign intended to set off 100 bombs on China’s National Day on Oct. 1 aimed at turning it into a “day of mourning,” the source told RFA’s Uyghur Service, speaking on condition of anonymity. Russian President Vladimir Putin praised plans for new joint economic projects between Russia and Pakistan on Tuesday, but called for closer cooperation between the two nations in fighting terrorism and the illegal drug trade. Six people were killed and 37 injured - some of them critically - after a female suicide bomber set off a bomb on a bus in Volgograd, central Russia. Local authorities have been put on high terror alert for the next 15 days. The apparent attack serves as another reminder of the grim effectiveness of female suicide bombers, who have taken part in 20 attacks claiming at least 780 lives across Russia since June 2000, or an average of 60 lives a year. 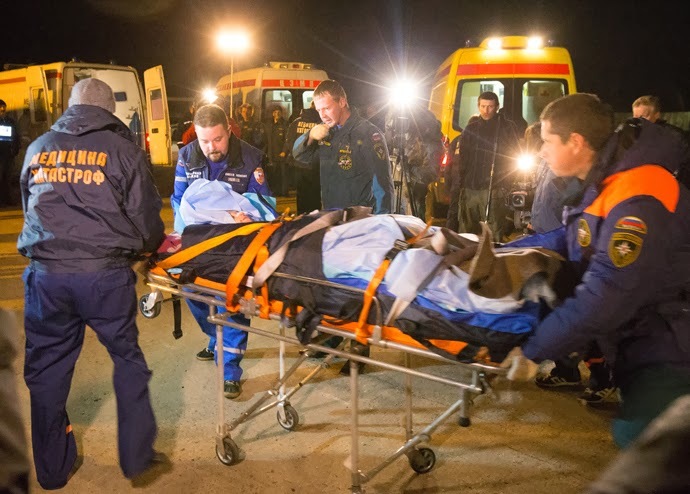 The two people, killed in a blast in the yard of a rural mosque in Russia’s North Caucasus region, were terrorists preparing for an attack on a funeral procession, the police said. The anti-terror body claims there are grounds to believe that the terrorists blew themselves up by accident as they were preparing for a major terrorist attack. But even this rather less successful attack is just another proof of Russia's persistent terrorism problem. So the Kremlin continues to tighten measures in dealing with the threat. Russian legislators unanimously passed the law, submitted on Putin's initiative, which forces relatives of terrorists to pay compensation for the inflicted damage. The Tatarstan government commission on the prevention of violations of the legislation has toughened the liability of the heads of municipal districts of Tatarstan for timely reports of manifestations of extremism, including by migrants. Tatarstan's Deputy Prime Minister Yury Kamaltynov said one of the channels of radical extremism in Tatarstan is migration from Central Asia. “Some political forces are using Islam, or, to be more precise, its radical movements that have never been popular among Russian Muslims, to weaken our state and to create regions with foreign-managed conflicts on Russian territory,” Putin said at the celebration of the 225th anniversary of the Central Spiritual Administration of Russian Muslims – the body responsible for cooperation between Muslims and state officials. When the Russian President announced the need to set up the monitoring system he said that the work must be done in cooperation with experts, civil society and also with cultural centers of Russia’s many peoples and ethnic groups. Putin explained that a special academic center dealing with the problem of ethnic tension had already been created on his initiative and that it is covering southern part of the Russian Federation and regions along the Volga River. "We are concerned that the people may return to our countries and will participate in destabilization of the situation," Bordyuzha noted. "I know that militants who fought in the Syrian Republic have been detained in some of our countries," he said. He believes a new technology that was tested in Libya and Chechnya to destabilize the situation is used in full in Syria at present.